A marriage of meat and greens in a zesty broth has become mis-translated into a vastly popular wintertime meal that you’ll never find at an Italian wedding. 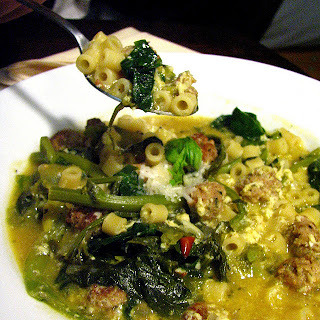 Called “Minestra maritata” in Italy (married soup), Italian wedding soup is a wonderful combination of protein and healthy carbohydrates that satisfies all who sup it. We always have a small bag of tiny macaroni in the pantry just to make this soup, which also consists of various combinations (depending on personal taste) of escarole, spinach, kale or cabbage, and meat, usually tiny meatballs, best made with a mixture of beef, pork or chicken, any blend, or even singly, and pasta. In Italy, the broth is a reduction of beef, pork, chicken with added bones, and then the meat is shredded and returned to the soup. But here in the USA meatballs are used with prepared broths. Regardless, this soup is really tasty, and if you prefer, the meatballs can be omitted. Either way, you will love it. Combine everything with moist hands in a large bowl. Make small balls with a teaspoon. Shape them into uniform balls and put on a platter. Cover and refrigerate till ready. Melt the fat in a soup pot. Put in the carrots, onions, garlic and salt and pepper and cook about three minutes until fragrant. Stir in the broth, tomatoes, the Marsala and bring to boiling. Put in the bay leaves, parsley and celery leaves. Some cooks fry the meatballs and others bake them. However, you can simply add them to the soup at this time. Stir well and then add the macaroni and simmer 15 minutes. Stir in the greens just until wilted. Taste for salt. If the soup seems too thick, add a little water. Top each bowl of soup with grated Parmesan cheese and serve. Um, super yum! I've been making a lot of soups lately (diet) and I'll add this one to my list! Another A to Zer, new follower!